People today have heard more about Google Glass that most think, it may be the first of its kind to come out in the market. The idea of a wearable eyeglass computer is actually not entirely new. While Google Glass may have all the publicity when it comes to wearable eyeglass computers, other similar products will give Google Glass a run for its money. For example, there is the new Recon Jet that might also interest early adopters when it comes out at the end of this year. 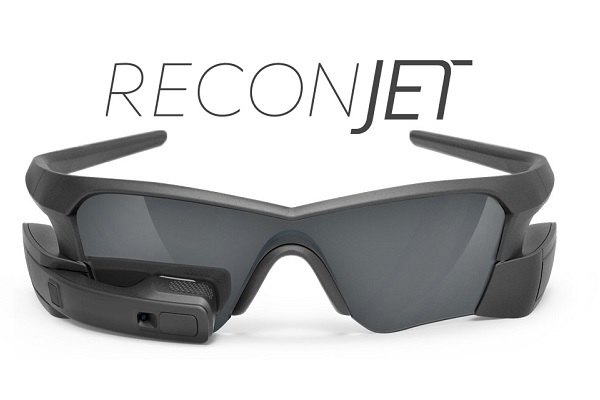 The Recon Jet is a wearable head mounted optical display that works as a useful computing device by way of using augmented reality. The Recon Jet is mainly designed for sports enthusiasts rather than for the common casual user as what the Google glass is designed for. As such, applications for the Recon Jet are aimed to provide important data such as performance metrics, weather, navigation and others. The main computer is attached to a cool looking pair of tinted glasses that will not make users do a double take when talking about wearing a heads up display everywhere. In fact, it makes users look even cooler. But more importantly, features components that make it a powerful computer despite its diminutive size. It packs a dual core CPU, an optical touchpad on the side, and HD camera and a high resolution display. It also comes with Bluetooth, WiFi and ANT+ support for third party sports performance devices. A bunch of sensors such as an on-board gyroscope, accelerometer, magnetometer, altimeter and thermometer help provide real time information of the surroundings to the user. The Recon Jet weighs only 60 grams and is designed for optimal comfort, even for athletes. The Recon Jet is currently available for pre-orders for the Pilot Edition for only US$499 until July 21. After that, the cool wearable computer eyewear will cost you US$599. Initial Recon Jet deliveries will start around December of this year.